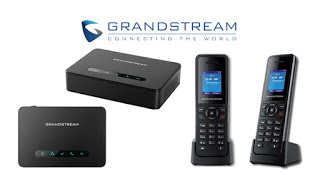 Grandstream Networks have just released their latest DECT IP Phone and Basestation which supersedes the DP715 and DP710. Previously the DP715 came with the handset and basestation already paired and ready for configuration. Plug the DP750 Basestation into your network via ethernet cable and then apply power to the device. The DP750 can be powered via the included 5VDC 1A Micro USB Power Supply or via 802.3af Power over Ethernet. Insert the included rechargeable batteries in the DP720 DECT IP Phone and apply power to the base before docking the DP720 with the included 5VDC Micro USB Power Supply. The DP720 can also be charged directly via Micro USB. On the back of the DP750 Basestation long press the Register button (release after approx 5sec once the wireless symbol starts flashing). The DP720 will now search and locate the DP750 Basestation. Once found you should receive a message on the DP720 screen that says "Subscribe Base" press the Subscribe button. If you have paired successfully you should see a success message and you should now see signal bars on the top left of the screen. You can register multiple DP720 DECT IP Phones to a single DP750 Basestation by simply repeating the steps above. You can also register your DP720 DECT IP Phone to multiple DP750 Basestations by simply repeating the steps above but selecting another Basestation (i.e. Base2, Base3, Base4). Please note the the DP720 will NOT ROAM between Basestations. Once the DP720 has disconnected from a base it will reconnect to the nearest Base.